THE RDA IGAD CAPACITY DEVELOPMENT FOR AGRICULTURE DATA WG IN ACTION! Even though there is a recognised need for capacity development in the fields of agricultural (open) data management, and a number of different organisations are attempting to address this, there does not seem to be a coordinated approach covering all agricultural domains which can adequately identify training gaps and make recommendations. four Forums on Open Data and Open Science in Agriculture for Africa. Committee on Data of the International Council for Science (CODATA) activities, including RDA-CODATA Summer Schools. By acting as a hub for coordinating the development and provision of training to potential stakeholders (agriculture experts, content and technology solution providers, researchers, policy makers), the Capacity Development for Agriculture Data WG will present various use cases and linkages to different sectors of development, as well as cite resources for a more in-depth examination of strategic actionable insights related to capacity development issues. In identifying and evaluating existing resources, the group will also address the language barrier. Additionally, in light of the above mentioned collaboration, the Capacity Development for Agriculture Data WG will develop ideas for Joint training programmes (both online and hands-on) in Agricultural data. provide the right role capacity distribution to all interested parties within the agriculture and nutrition ecosystem, in order to support the achievement of the SDGs through the effective and responsible managing of today’s large scale data assets and networks. Lastly, the sharing of knowledge about training initiatives and technologies will reduce digital gaps and will therefore benefit researchers and domain experts in developing countries. Expand the common impact of open agricultural research by joining synergies in training programmes using the guidelines developed by key (agriculture) data management capacity building communities: GODAN, IGAD, CODATA. CONTRIBUTE WITH IDEAS AND STAY IN THE LOOP! 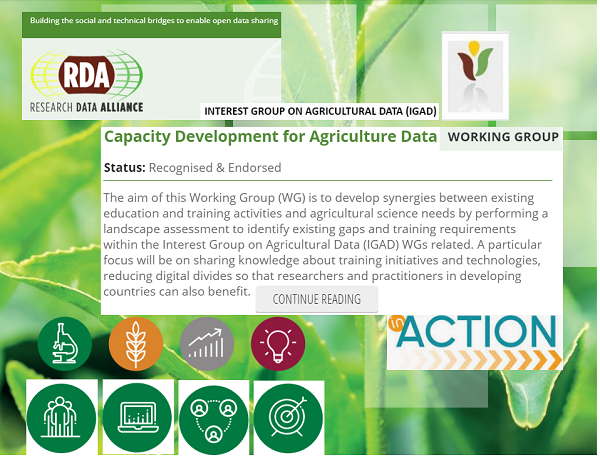 The Capacity Development for Agriculture Data WG will carry out all discussions through the IGAD mailing list <rda-agrdatainterop-ig@rda-groups.org> to ensure openness and include everyone in the capacity development training activities. This will ensure that all points are discussed in an open and participatory way. Interest Group in Agricultural Data (IGAD) RDA Pre-Meeting P12 will be held on 5-6 November 2018, within International Data Week - a global conference which is taking place in Africa for the first time! International Data Week (IDW 2018) will be hosted (on 5-8 November 2018, Gaborone, Botswana) by the Botswana Open Science and Open Data Forum, and co-organized by the ICSU Committee on Data for Science and Technology (CODATA), the ICSU World Data System (WDS) and the Research Data Alliance (RDA). IDW 2018 will bring together data professionals and researchers from all disciplines and from all parts of the globe. International Data Week – Deadlines are Fast Approaching!